The ultimate wedding dream-come-true wedding, all expenses paid, is now just 10 months away! 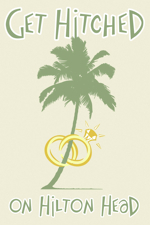 The Get Hitched on Hilton Head Island contestants began registering their tales of true love online this month and as you can see though these samples, the range of explanations, home town location and heartfelt adulation is wide and captivating. The island’s largest wedding giveaway effort ever will continue to accept registrations through Valentine’s Day, February 14th. Meanwhile, community vendors are stepping up with offers to support the exciting event with accommodations, catering, flowers, photography, spa services, golf and more. It’s their opportunity to shine via grassroots efforts that have attracted national attention, including a panel of celebrity judges from New York to Savannah. Details on the judges coming in our March issue! If you know someone who is about to get hitched or if you are contemplating taking the plunge yourself, let us know how you the magic all began for you and your darling Valentine! You can register online at these addresses: WeCelebrateYou.com or CelebrateHiltonHead.com. Or talk to us on our Facebook page, Get Hitched on Hilton Head Island! If you would like to participate in this exciting wish-fulfillment campaign as a vendor, please call: 843.689.7526. Partner vendors will be featured in all event promotion and advertising. When you first met, what was the most memorable quality of your significant other? The first thing that I noticed about Jason was his beautiful smile, but as the date went on I realized that he is also incredibly funny. He still makes me laugh all of the time, and I look forward most to all of the years of laughter we will share. Why do you want to be married on Hilton Head Island? I have worked in the travel industry since college, and I have always heard of what a beautiful place Hilton Head Island is, so when we started talking about a destination wedding it was the first place that I thought of. I love the beauty of the ocean, mixed with the charm and elegance of the south. In 100 words or less, please describe what makes your story unique. Why are you most deserving of an all-expenses paid wedding weekend? I feel like our story is unique because in spite of all of the obstacles that life has thrown our way we have never given up on wanting to be together. We were twenty years old when we were set up on a blind date, and neither of us were looking for a relationship. Our connection was so strong, that we decided we were gonna make it work in spite of the distance. When Jason was deployed to Iraq in 2005, he said he would understand if it was too hard for me, but again it made our love stronger. When he returned we started talking about getting married, but then my job transferred me out of state. After nine months away, we decided that we had spent enough time apart and were ready to spend our lives together. Right now we are saving for our first house, and having this dream wedding would be the perfect way to start our life finally TOGETHER! I was annoyed with her because I was trying to pay attention in class, but she kept talking to me. I really needed to get a good grade, but could not pay attention to the professor. Now I realize that I will always want to be “annoyed by her”. If she wants my attention, she has it. I have grown up going to HHI. I have been going there all my life, and know how wonderful it is there. What a great way to share HHI with my wife to be, and we can start our life together with HHI in our life. I want to take my children there, like my parents took me. We meet while we were cadets at West Point Military Academy. We will graduate in May, and will be married the following weekend, before we are assigned to our post. We are both going to be in the Military for many years, and HHI would be a great place to start our life together. We won’t get to see our families very often, and a celebration with all of our families on HHI would be perfect. Her eyes. She had the most beautiful blue eyes I had ever seen. They were as bright as the Caribbean waters and I couldn’t stop staring into them. She was absolutely mesmerizing, which was strange for me because I was only 17 years old when I met her. We have been there several times and find it to be comfortable and relaxing. It is our home away from home. Even though we met when I was 17, we did not start dating until I was 21. On our first official date, I told her I was going to marry her one day. We have been through a lot since then. During her first year of law school she had several ulcers on her left eye and lost vision in that eye. She had to drop out of school because the pain was intolerable. She had to have her eye sewn shut in an effort to heal it. Even though she lost her vision, she did not lose her drive, and eventually enrolled back in law school. She just graduated and it was finally the right time to propose. Even though we do not have much money, I want to give her the wedding of her dreams. She has worked so hard, and she is the most strong, amazing woman I have ever met. She deserves this gift, and I hope I can give it to her. His determination. In Iowa, wrestling is a big deal and he wrestled and wanted to be a state champion. I noticed that nothing would stand in his way and he didn’t let anything get to him (except me :) ) And he won the state championship three times while in high school and we were dating! It is the most beautiful place we have ever visited, with its great beach sunsets, the moss hanging from the trees, and the fine white sand. It would also be a great experience for our families, who would not have to travel far to enjoy our special day. Throughout our relationship, Hilton Head as been a place we have visited and grown closer together as we walked the beaches. I first met him in gym class in junior high. He asked me to be his tennis partner but I turned him down because I already had another partner. That didn’t stop him from pursuing me over the next year. I finally said “yes” to being his girlfriend and 8 years later I said “yes” to being his wife! I now hope to say “I do” in Hilton Head. Kyle is paying his way through law school and I paid my way through nursing school, so an all expense paid wedding would be a blessing! We took our first trip to Hilton Head around our 1 year anniversary. We stayed at the Sea Pines and completely fell in love deeper than I thought was possible. We love the Salty Dog, and taking walks to the Lighthouse, and everything about the whole island. Every year since then we have taken at least one trip back, and that is why we decided to do a destination wedding there. My parents, and my maid of honor, my brother, his girlfriend, my aunt, and the two of us are driving up next weekend to look around for the wedding and start planning! It would be the storybook ending that our lovestory needs. The love of my life resides in Ireland and I the USA. We’ve had to struggle through a long distance relationship and after being forced to live apart for so long we are going to get married and finally be together. I’ve always dreamed of a beautiful wedding but the cost of international travel has forced us to endure a financial strain. The only possibility for me to have the wedding I’ve always dreamed of would be for us to win this all expenses paid wedding. I’m so blessed to have stumbled across this opportunity and would be so thankful. He still made me laugh like he did back in middle school when we dated!! We both love the beach and think this would be the PERFECT place!! It all started back in the 7th grade when Brad asked me to be his girlfriend. We had the best time together, going to the skating rink every weekend. Then time went on and we grew apart. Twenty seven years later, we found each other on Facebook and planned to meet one night. I ended up running into him and a friend at a restaurant the day of our planned date. I was nervous & anxious and did not want to go speak to him, but with a little encouragement from my daughter, I finally went over to him. It was love all over again! And from that moment on, we have been inseparable.